Exposure Brewing Co. Clementine Wit, originally uploaded by adambarhan. 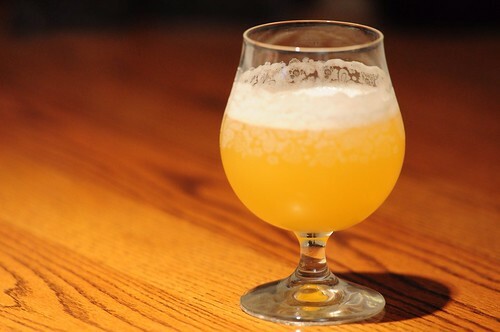 A: The beer pours a hazy golden color with a rather large white head that calms down pretty quick. S: Clementines are prominent in the smell. Not too much coriander coming since the clementines are a bit strong. T: A nice citrus flavor with lemon and orange peel. Like with the aroma, there really isn’t much spice or malt flavor but overwhelmed by clementines. Some sweetness, but it’s more candy/sugar-like. M: Light in body with medium carbonation. O: Not really much witbier character to this. Will try a different fruit regime next time to this, a hint of orange would be good with more of a classic wit taste.